"Fighter Pilot's" book panned. Hilariously. You are at:Home»Navy»"Fighter Pilot's" book panned. Hilariously. Shannon Ray Anderson, who has zero traps to his name, published this how-to guide on becoming a fighter pilot. // Book cover from Amazon. Unless you like to get pummeled in the ready room, this is exactly what you shouldn’t do before you try to become a fighter pilot. 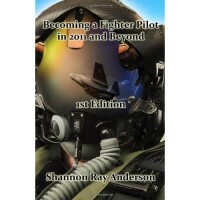 Ensign Shannon Ray Anderson wrote a self-help book that promises to show anyone who is interested the path to become a fighter pilot. But there’s a catch: Anderson is not a fighter pilot. He’s a student at Training Wing 2, flying T-45 Goshawks. He doesn’t have wings of gold, hasn’t made it through a Fleet Replacement Squadron, or hit any of the milestones that make a fighter pilot a fighter pilot. Besides his initial flight training, he’s as much of a fighter pilot as everyone at Scoop Deck. Naval aviation is one of the tightest communities in the military, and probably has the strongest sense of self-identity. And as one reviewer pointed out, with this book Anderson is claiming membership to an exclusive club he’s not really a part of. And as another mentioned, the book is going to bring a ton of unwanted attention that may score him a new callsign: Bullseye. It’s probably safe to say that there won’t be a second edition. F L Y N A V Y !